Multi-Genre, quirky Pop-Jazz with elements of spoken word and satirical social commentary. Funny and hip. 8. Hey! Whatcha' Tryin' To Prove With That Hairdo? Everything's Normal Here is a true departure from most albums. 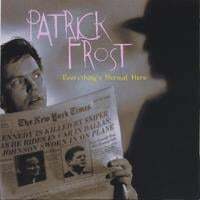 Released in 1997, the CD is a musical journey through the mind of it's creator, Patrick Frost. A quick glance at the song titles will give an idea of what's inside. A collage of musical styles, social and political satire, stream of conciousness beat poetry and cleverly crafted pop hooks. Frost is a musical artist from Orlando, Florida. His resume includes extensive work as a studio composer/producer, a performing musician. Patrick is a believer in the album as an artistic canvas designed to be consumed as a whole. This idea of conceptual continuity is a crucial element in the work of his major influences which include Frank Zappa, Joe Jackson, Brian Wilson, Tom Waits, The Beatles and Captain Beefheart. and former Spewns Bassist -Brett Bennett. This is a wild romp through pop music history that will make you laugh, dance, and think. Showing a long list of influences, Mr. Frost takes you for a crazy ride through all the facets of popular music from the last couple of decades to the present. It's great to hear this mew talent and I can't wait for more!